We had a false start but this time it's for real. 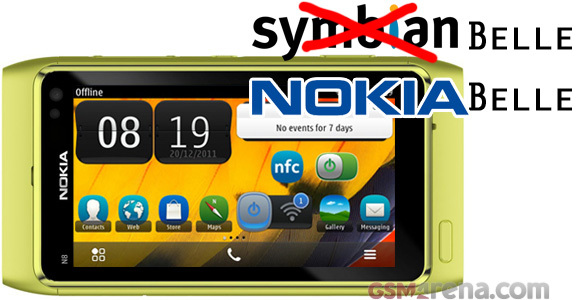 The Belle update for older Nokias is officially scheduled on the Finnish company's calendar for February 2012. The Nokia Belle... wait, what? It seems that Nokia have given up on the Symbian name and is now calling the OS simply "Nokia Belle". We'll get back to that in a minute. For now, here are the relevant details about the update - existing owners of Nokia N8, E7, E6, X7, C6-01, C7 and Oro can expect Belle in February next year. Also, several models (N8, C7 and C6-01) are headed to shops with Nokia Belle out of the box. They'll be available in China initially and will later expand to other markets. There are no other enhancements to the models, except getting the latest OS early. You can read our Belle review to see just what you'll be getting with the update. Back to the name - Nokia recently handed development of Symbian over to Accenture and are now even removing the name of the OS from their phones. It's not a huge loss, unless you're nostalgic about the years of history. Still, it was a rather unexpected rebranding, especially when you consider it's not their primary OS anymore.